Choose from three temperature settings for instant food, tea, coffee, milk powder, plus a keep warm option. 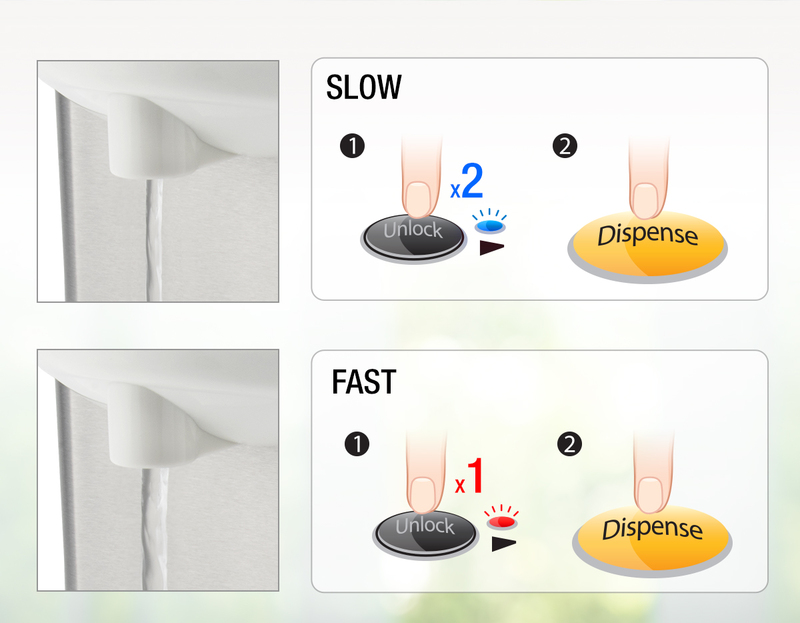 A light indication just below the dispenser is designed to conveniently allow you to grab your hot water during those early mornings or late nights. Use the sturdy handle to safely relocate the boiler from one room to another with ease. 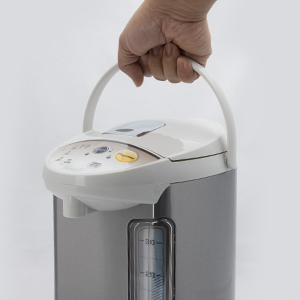 The electric pump conveniently dispenses up to 4 Liters of fresh hot water to suit your needs. Choose from either slow speed to fill up small volume cups, glasses, bottles or fast speed for large volume jars, bowls and pots. Safeguard your device if you forget to turn off the power when out of town. 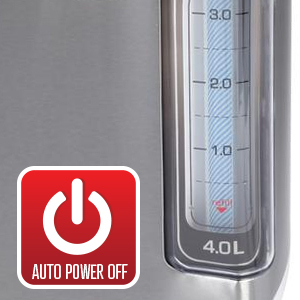 The auto electric pump lock on the water outlet keeps you and little ones safe from boiling water burns. 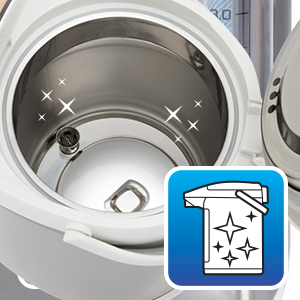 Built-in automatic clean cycle removes water scale buildup. Use this to preserve the appliance. 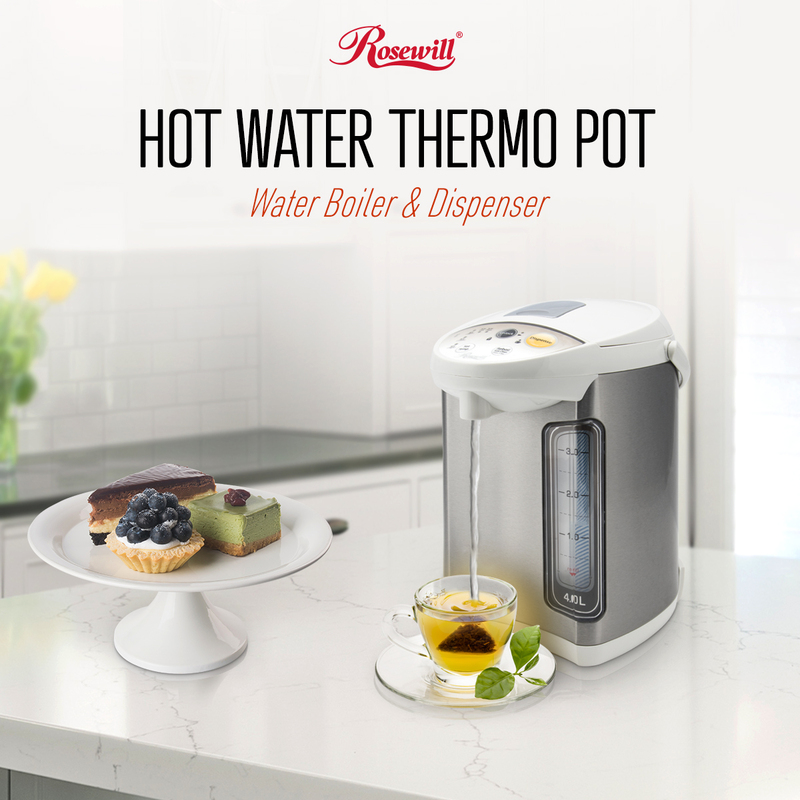 Both stylish and durable, this hot water boiler is a seamless and lasting addition to any countertop with its stainless steel exterior/interior and compact design. 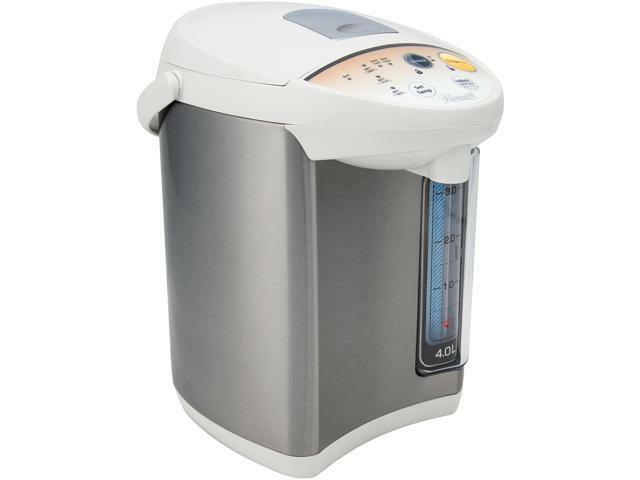 With 4.0L capacity and 700 watts power usage, the Rosewill RHAP-16001 electric water boiler, dispenser and warmer is great for home and office, allowing you to get pipping hot water in minutes for tea, hot cereal, instant noodles and hot beverage. 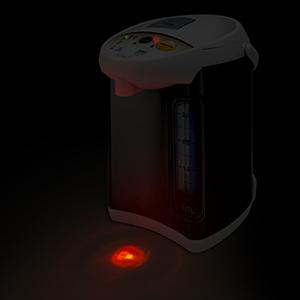 This electrical water boiler, dispenser and warmer features bottom heater and is controlled by micro computer for accurate heating. 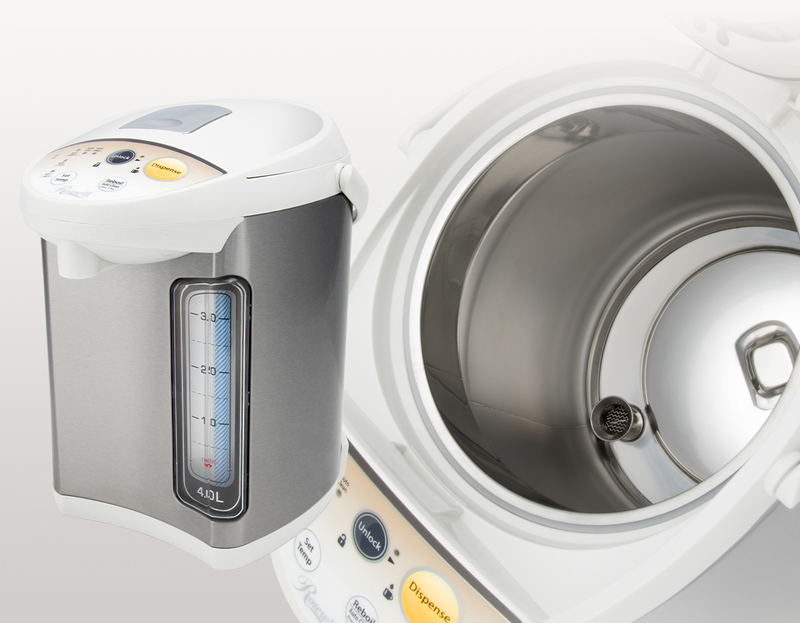 It offers three temperature settings for instant food, tea (208 degree F), coffee (195 degree F), milk powder (175 degree F), plus keep warm(140 degree F). Its water outlet features auto electric pump and two types of water feed to suit your needs: small volume and slow speed in blue light, big volume and fast speed in red light. The dry-boil protection safeguards your device in case you forget to turn off the power when out of town. 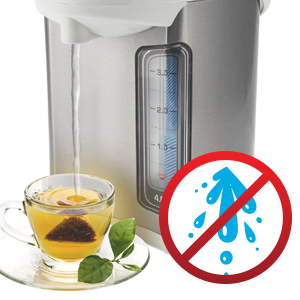 Hot water splash prevention and auto electric pump lock on the water outlet keep you and little ones from scalding by boiling water. A big window water-level gauge allows you to read the water level at a glance. The night light indication design is convenient to get water at night. A sturdy handle lets you move the boiler easily, even with hot water in. Plus, with spacing-saving design and stainless steel exterior and interior that is stylish and durable, this electric boiler is a seamless addition to any countertop. Cons: used and not new !!! Other Thoughts: Buyer beware!!! I just received a seems-to-be someone's else return instead of a new. The factory seal is opened and there are finger prints already on the boiler! I am so sorry you received a wrong RHAP-16001. Please contact us with an electronic copy of order invoice and we can further assist you with a replacement of the RHAP-16001. We do care about your feedback and will continue improving our products in future. We are really sorry for the defective item and do understand your frustration; we offer 1-year warranty for this model. Please feel free to contact us to claim your warranty with your order invoice based on our policy. We do care about your feedback and will continue improving our products in future. Other Thoughts: get the job done. 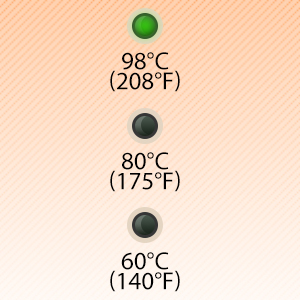 Cons: -can't heat up to the different temperatures, only the max. -might just be the one I got but the keep warm feature doesn't work at all. The settings only let me know what temp it was at but didn't keep it there. Other Thoughts: I'm giving this one star because it fails miserably at delivering on the promise that I bought it for. I wanted something that could heat to and keep heated water at different temperatures and this can't. Hopefully I can get my money back. We strive to provide the best quality and service to you. Please contact our support team for your replacement warranty options. Thank you.